Over the weekend, I taught a group of moms how to start prepping homemade meals for their freezers, and I’m excited to share my tips with you too. Making homemade freezer meals is easy once you get the hang of it. I started making freezer meals when my older daughter Cameran was a baby. Having a lasagna or pan of macaroni and cheese in the freezer cut down on my stress level around holidays and birthday parties. Before my second daughter Isla was born, I prepped and froze two week’s worth of dinners. It was amazing to have homemade meals on-hand while I was recovering and bonding with the newest member of my family. All of the recipes in my cookbook were written for beginners. I share my most helpful freezer tips at the beginning of the cookbook, and include instructions about how to prep, freeze, and cook every recipe. Once you get the hang of freezer cooking, I know you’ll be hooked. I simply can’t say enough good things about homemade freezer meals. 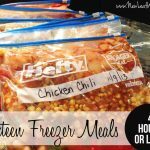 Freezer meals will save you time and money, and help your family to eat healthier. 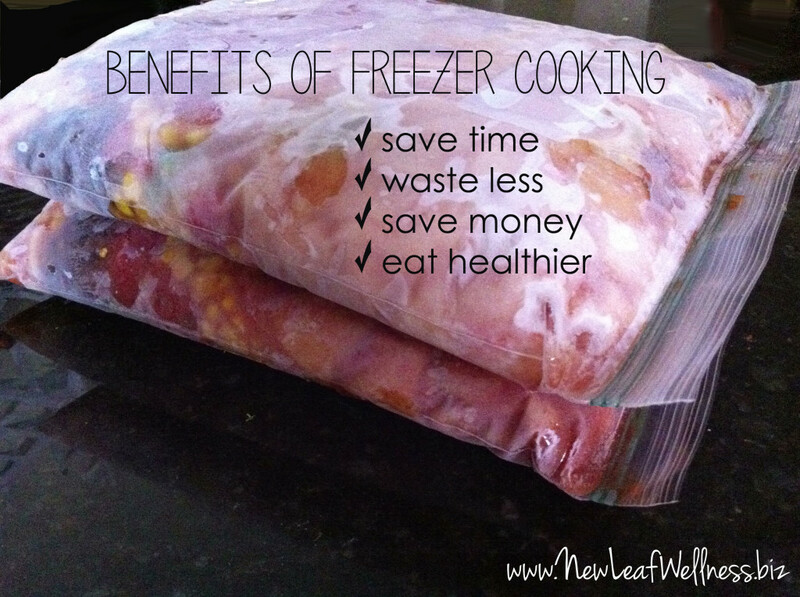 Planning freezer meals in advance also means you won’t be buying other meats and produce that go to waste. If you have never frozen anything before, you need to start with deciding what you want to make. My husband and I always plan at least one week of meals ahead of time. Recently, we started planning TWO weeks of meals at a time, so freezing has become even more important. Here are some of the BEST and WORST freezer meal ideas to help you figure out what will do well in your freezer. This isn’t an exhaustive list, but it’s a good place to start. All of the awesome recipes in my ‘15-Minute Freezer Recipes‘ cookbook! 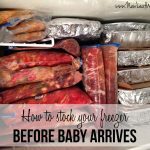 Once you pick a recipe, you’ve made the first big step toward becoming a ‘freezer mom.’ Now, you need to grocery shop for the ingredients, clean out some space in your freezer, and pick a time to prep your freezer meal. I have two strategies: 1) doubling a recipe and making one for dinner and freezing the second, and 2) devoting an hour or two to prepping 3-6 dinners for my freezer at once. Since most of my recipes are super quick, I can prep three in an hour or less. I can normally find an hour first thing in the morning when my daughters are just waking up, in the afternoon when my younger daughter is napping, or over the weekend. Prepare meals until the point that you would put them in your oven or slow cooker (AKA Crockpot) to cook. At that point, cool them to room temperature (if they’re hot) and put them into your freezer. 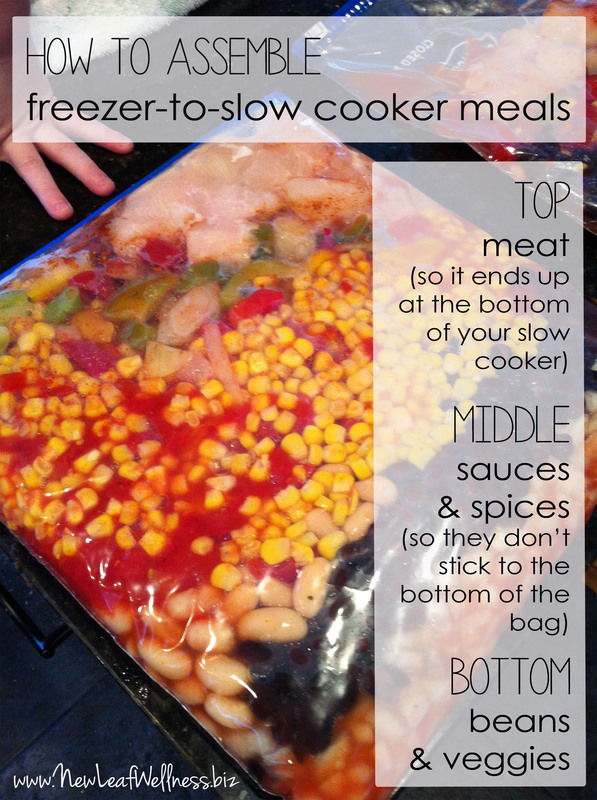 For slow cooker recipes, fill your gallon-sized plastic freezer bag like this: beans and vegetables at the bottom, sauces and spices in the middle, and meat at the top. For oven recipes, store meals in aluminum or glass pans. Place layers of plastic wrap and aluminum foil on the top. If you don’t have a lot of pans on-hand, you may want to use disposable aluminum pans because you can’t cook with pans that are in the freezer. When storing meals in gallon-sized freezer bags, remove as much air as possible before sealing the bag. This will help your meal keep better. Using bags with a zipper will help you remove air without making a mess. Freeze bags flat in your freezer. 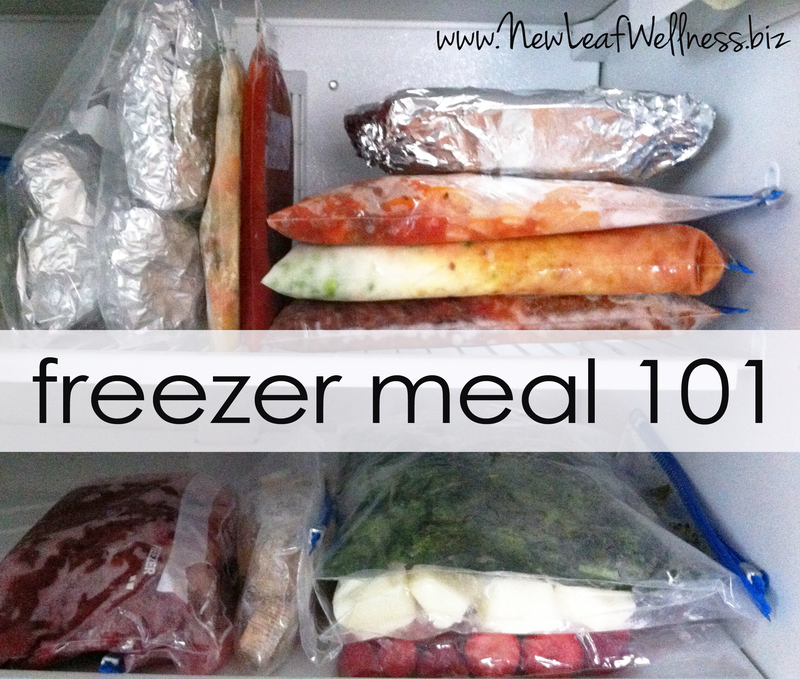 Most freezer meals can be stored up to 3 months in a regular freezer. Thaw your oven recipes in your refrigerator overnight before cooking them. Thawing will help your oven freezer meal cook more evenly. (If you forget this step, thaw your oven recipe in your refrigerator the morning and afternoon that you’re planning to cook it – or skip the thawing step altogether and just monitor your meal in the oven to make sure it doesn’t burn). I cook all of my slow cooker recipes on the “low” setting. I use a basic 4-quart slow cooker. Slow cookers work best when they are at least 1/3 full, but no more than 2/3 full. Oven recipes that come straight from the freezer will take longer to cook than room temperature meals. You may want to keep them covered with foil so they don’t burn. If you have more questions, leave a comment below or email me and I’ll get back to you as soon as I can! 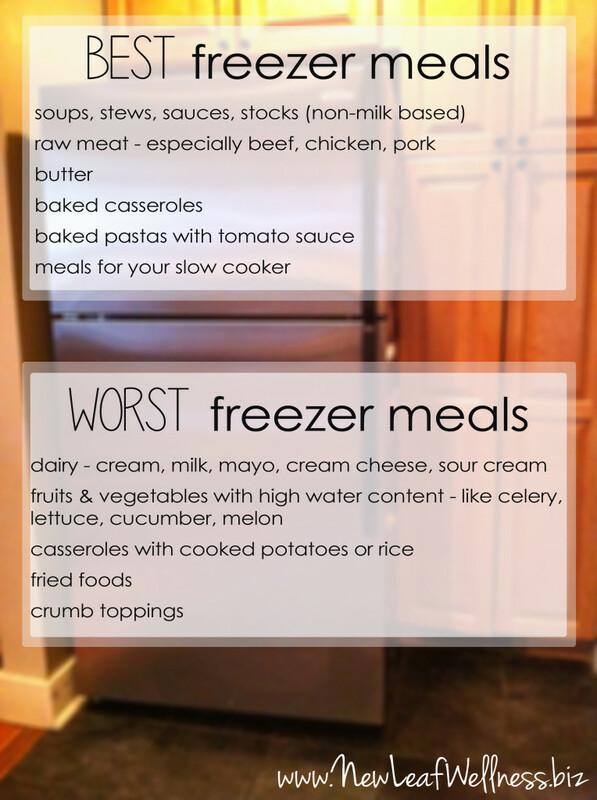 Have you ever made freezer meals before? If not, what makes you want to get started now? Is there any problem with the meat being tough because it has been frozen? That’s a good idea, Cathy. I’m really not sure. I saw a freezer recipe on Once a Month Meals for ham and potato chowder that recommends freezing potatoes AND celery raw, so I’m going to give them another try this weekend and see what happens. Did you have success freezing the potatoes and celery raw? My friends and I are starting a freezer meal swap, and I want to make sure I prep everything correctly. Hi Kelly, I am new to your site and am a full time working mom of 3. Going to try the freezer cooking for my family! With recipes like your chicken chili, is the chicken mixed with everything raw or pre cooked? Wasn’t sure if there was a problem with the raw meat or not. Thanks!! It’s frozen raw. That’s what’s so great about it – it takes very little time to prep and since it cooks for the first time out if the freezer it doesn’t taste like leftovers at all! There’s no problem with freezing raw meat with other ingredients. You will love freezer cooking!! 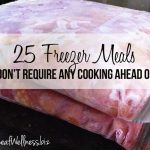 Check out my list of “25 freezer meals that don’t require any cooking ahead of time” for more ideas meals can be frozen without cooking. Let me know if you have other questions! Thanks for all of these useful tips! I am new to this, but I’m definitely going to give it a try! I do have a question, why not freeze the oven recipes in freezer bags as well to save room in the freezer? Thanks! What kind of recipe? There’s nothing wrong with it, per se, but I’m trying to figure out how you’d get it into and out of the bag (and if it would fit). A lot of my oven recipes are casseroles. You could line the pan with freezer wrap, put the casserole in there, freeze it enough to get it out of the pan and then freeze it either in freezer wrap or a large bag. Before thawing, unwrap it enough to put it back in your 9×13″ pan and you are set. This saves space in your freezer. I never even considered that! Great idea. I will try it next time. Thanks!! One more quick question for you… what do you generally do with marinated meats? I have a fantastic marinated flank steak recipe that I use a lot for fajitas, and I’m wondering how you think it would hold up in the freezer? I think it would taste great…and would probably taste good in the crockpot too! Awesome thanks! Also, does raw meat generally hold up in the freezer better if it’s in its original state, or can i save myself some prep by cutting it into slices before freezing it? I would freeze it the way you normally cook it. For example, I freeze my beef roasts whole because I think they stay juicier when they cook whole, but I freeze chicken cubed to add to my chicken chili. Hope that helps! Also, do you have a copy if my No Cook Freezer Meals cookbook? All of those recipes includes instructions about how to freeze.